Before the twitch-restarting of Super Meat Boy or weird hacks of Super Mario Bros. built for maximum frustration there was the San Francisco level of Tony Hawk’s Pro Skater 4. It was here that this manual-gap-manual combo reduced me to a broken teen. I’ve recently set up a “game room” in part of my office with some older consoles, and to test out my setup I grabbed a favorite game: Tony Hawk’s Pro Skater 4 for the PS2. It’s a game that is precariously balanced between a really fun casual time and the most nail biting, frustrating experience that you can imagine, and a lot of that comes down to really fiddly grinding and manual mechanics that demand a lot from the player. I’ve never been the best at the game, but I enjoy it a lot, so imagine my worry when I reached the “Manual, Gap, and Manual the Proset” mission in the game’s second level. It asks you to do exactly what it says. You need to balance on the back wheels of your skateboard as you navigate a small wooden pathway, jump over a gap, and then continue navigating on those back wheels until the pathway ends. Simple. A video of a player absolutely demolishing a challenge that took me a full half hour to complete. It wasn’t simple for me. The manual dexterity, no pun intended, that it required me to summon up from the depths of my THPS muscles was so intense that I caught myself clenching my jaw in dull frustration. I failed over and over and over again, either failing to get on the pathway properly or missing the second pathway after the gap. This was more distressing and twitchy than any game that I’ve played in the past decade. It wasn’t about being twitchy and hard, it was just a little challenge with some very strict rules that I had to figure out the exact right button presses to complete. THIS THING IS DRIVING ME NUTS.IT’S ONE WHERE KOSTON TELLS YOU TO MANUAL THE PLYWOOD “ROLLER COASTER” CLEAR THE GAP, AND BACK TO MANUAL ALL IN ONE COMBO.I’VE DONE IT ABOUT 100 TIMES AND IT ALWAYS FAILS ME.DOES ANYONE KNOW HOW TO BEAT THIS THING? There’s something special about finding those button presses and executing them perfectly, and it really made me miss the heyday of the THPS franchise. At its best, these games were about Eric Koston (or other pros) giving you difficult challenges that you solved with a little bit of creativity and a lot of practice, and I actually enjoy the laser focus that I needed to get over that little gap last night. 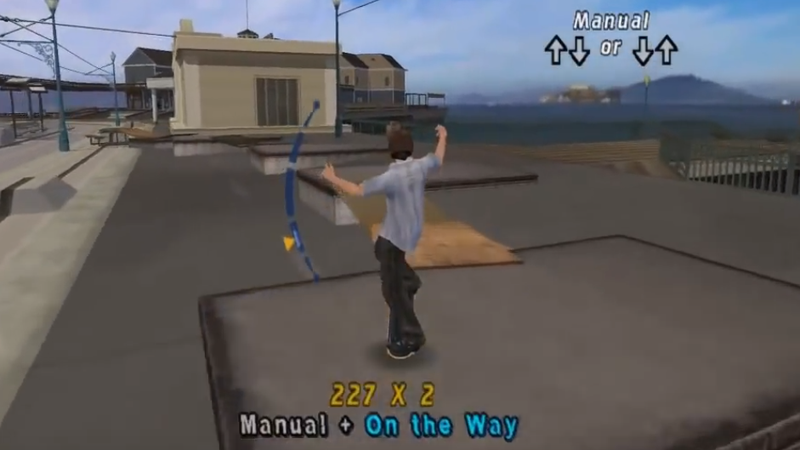 I salute you, manual-gap-manual, because you are super bogus and still very difficult for me 16 years after release.